A new “student” joined our home school today! 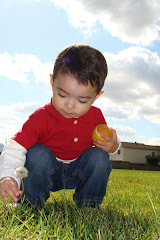 Our viisiting student recently turned four years old, is new to Montessori education and will be known as ‘Lo’ on this blog (what RJ calls him since he is not able to pronounce his real name). I am not sure how long Lo will be joining us, but I decided to introduce him to our classroom since I will be caring for him on three days this week (during our normal class time hours). During our rug time Lo enjoyed playing the maracas and eagerly joined the singing of unfamiliar songs, even the Spanish ones! After our rug time we gave Lo a mini-tour of our classroom and CC helped me go over some of our classroom rules. 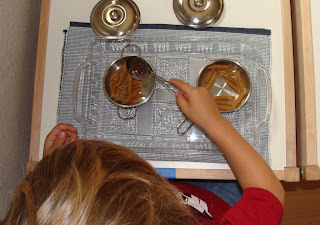 The first activity that Lo chose to work on was the transfer/spooning of pasta. Initially, Lo did taste the pasta and said that he was going to mix it and take some to CC and RJ. But after I explained the activity and a gave him quick demonstration, Lo easily completed the task with only a few spills. The activity that CC is smiling at below is new. 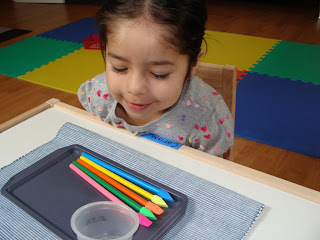 It is a very simple color pencils and erasers matching activity that I had in mind to help RJ work on his colors. Unexpectedly, it was more appealing to CC and Lo today. ...before getting distracted with the new boy in class. You can also see RJ in the background. He did not show much interest in Lo and kept busy (mostly) working on his own work today. 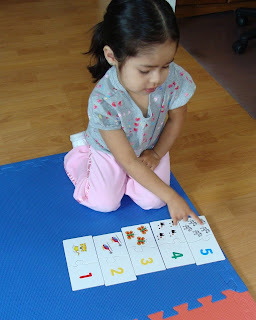 After observing Lo for a while CC did get back to her own work and completed a number of activities but always seemed to be alert to what Lo was doing in the classroom. 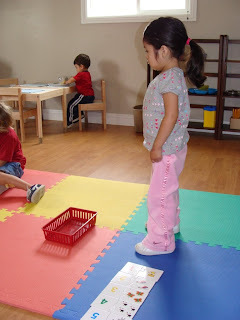 And when she saw that Lo was not working on an activity correctly she made sure to let him know. 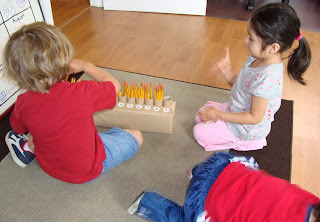 On a side note… Lo did complete the spindles/pencils counting activity but did not seem to have a good understanding of the number zero, so the spindle activity was a great opportunity for him to learn about the number zero. 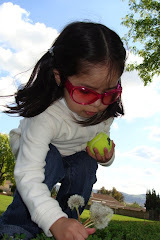 Overall, I feel that Lo did well in the classroom and enjoyed working on many activities. He did seem to want to rush through activities so that he could move on to the next one. And he did not repeat any one activity in particular. I believe this might be the case because our classroom set up is new to him (he normally attends a traditional preschool). I am curious to find out how the next couple of days go. After our class session the three kids and I enjoyed playing outside, blowing bubbles, coloring, drawing and chalk writing. The following has nothing to do with home school or Lo’s first day, but since I also took these pictures today, I thought I would share them as well (and I know Dad will enjoy them). CC and RJ started a gymnastics class three weeks ago. CC has taken this class in the past and she is loving it as usual, and RJ is adapting well. He does get distracted now and then, but his attention span is improving each week. 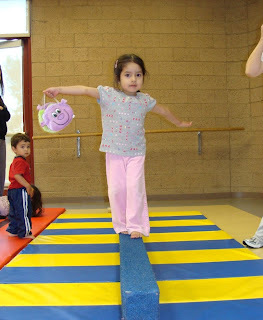 Here is CC on the low balance beam while RJ patiently waits his turn. 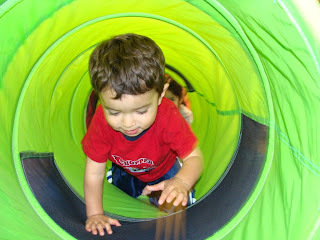 RJ loved crawling through the tunnel part of today's obstacle course. Comments are welcomed and appreciated! If you leave a comment with a question, I will reply with another comment. Please come back and check the post. I can also reply directly if you leave an email address. Magic School Bus- All About Earth DVD GIVEAWAY!